Support Your Local Yarn Store & The Designers You Love: Buy Patterns! Everyone’s getting ready for the Knit-A-Long–this just get’s more exciting! 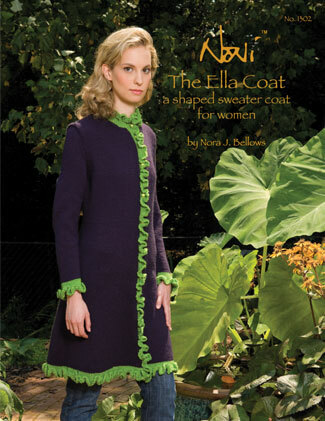 Let me take this opportunity to make a personal plea to you, kind and gentle knitter, to purchase your own copy of the Ella Coat for Women pattern at your local yarn store. Those who know me know how passionate I am about copyright laws. Some of you might already feel your attention flagging, but please hear me out. I’ve written here before about how we indy designers make our livings (or try!) from selling patterns. So, while I LOVE the idea of sitting elbow to elbow with a circle of women all squinting to read from a single xeroxed pattern because it builds character and community, it doesn’t put even a crust of bread on the table of the indy designer whose pattern it is or the yarn store who stocks that pattern. I beg of you to reserve such bonding experiences for the free knitting patterns now fluttering hither and yon practically out of car windows. Noni has solicited the participation of local yarns stores all over the country and internationally to support the Ella Coat Knit-A-Long. They have patterns and appropriate yarns at the ready for you to choose from. Support our efforts with your purchases. Don’t forget how powerful you are in supporting the designers you love and the small business, the local yarn stores, where you make your pattern and other knitting purchases. Purchase patterns with pride: know that you are directly supporting the arts, the work of the designers you buy. You are directly . . . let me say that yet more slowly and passionately (if you were here, you’d see me get a little emotional): you are di-rectly supporting us and your own community. I speak on behalf of all of us who draft, re-draft, test, tech-edit, re-work, publish designs in hope you will love them, knit them, wear them, and bequeath them: thank you for supporting our work with your time, your passion for knitting, your hard earned dollars. Thank you for purchasing for your friends their own patterns instead of making copies of yours. Thank you for understanding in your heart of hearts that designs you love are the foundation of our art and for feeling it is more than ever important to demonstrate that understanding by purchasing your very own copy of The Ella Coat for Women pattern. Now, let me also say this. If you are a woman who would LOVE to participate in this knit-a-long but just simply don’t have the funds to purchase a pattern. And you are even now unraveling sweaters to have enough yarn, please write to me, tell me a little of your story, and I will see to it myself that you have your own pattern. Likewise, if you know a woman who SIMPLY CANNOT afford a Noni pattern, please write to me with your story and I will see what I can do. So, now that we have all gone to our local yarn stores and we all have our own patterns . . . now we can begin to think about the other needed supplies. . . more about those supplies and also more about yarn in postings coming soon. Your pattern purchase allows me to keep designing. Thank you and thank you again.